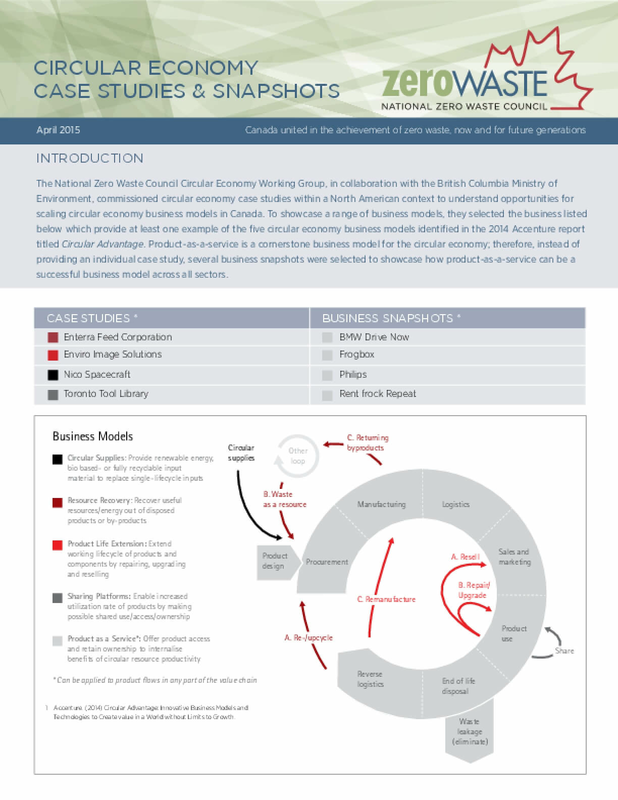 The National Zero Waste Council Circular Economy Working Group, in collaboration with the British Columbia Ministry of Environment, commissioned circular economy case studies within a North American context to understand opportunities for scaling circular economy business models in Canada. To showcase a range of business models, they selected the business listed below which provide at least one example of the five circular economy business models identified in the 2014 Accenture report titled Circular Advantage. Product-as-a-service is a cornerstone business model for the circular economy; therefore, instead of providing an individual case study, several business snapshots were selected to showcase how product-as-a-service can be a successful business model across all sectors. Copyright 2015 by National Zero Waste Council Circular Economy Working Group. All rights reserved.